Drag and drop recipes on FoodCoach.Me into your menu and auto create the shopping list. You can also access the Dashboard with the dropdown menu under “My Account” in the top navigation. Scroll down slightly on the Dashboard Page and you will see the Menu Planner. 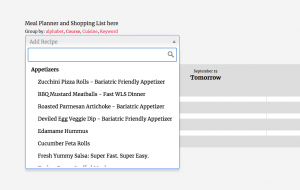 The menu planner tool can be cumbersome to use at first and takes some time getting acclimated. While this is true with most of this type of software, we do hope to see improvements in this feature from the developers of the plugin we use! The drop down box contains ALL the recipes on FoodCoach.Me. Since there are over 500, it helps to use the search bar. You can use key words like “chicken, pesto, grilled” for example. I find it best to sort by course. You can scroll through for recipes that catch your eye or search recipes by name if you know what you are looking for. When you have selected a recipe, you click on the name and the thumbnail image appears. You can then drag and drop the recipe into the calendar below. By click on the image inside the calendar, that recipe will enlarge slightly and is also LINKED to that recipe. Also at this time you can adjust the servings you’d like to make. Note: The meal plan will show 5 days at a time. You can click to move the dates farther ahead if you would like to plan more than shown. If your plan is not showing recipes you know you have added, try clicking the arrows on the top of the plan to the right and to the left to see if they reappear. This has been an issue for some users and we are working to resolve the problem! 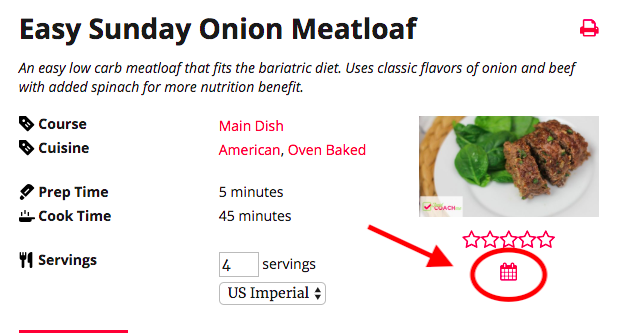 *New* you can now add a recipe to your meal plan inside the recipe post. If you are on your desktop computer, you will only need to hover over the icon and the box to select the date and which meal will appear. Select your date before your meal as it will add it to the plan right away. If you’d like to change the day or meal you will go back to the meal planner located in the dashboard. Hover over My Account then select Dashboard. Inside the meal planner you can drag and drop the recipe to another day or change the portion size by clicking on the image of the recipe. You can also delete the recipe by click on the image of the recipe and looking for the (very small) icon of a trashcan. When you are ready, click on the “generate shopping list” on the bottom of the menu planner. You can select whether you use the US measurements or the metric system. This is also when you will select the dates you’d like to make a list for. If you have planned more than the 5 days shown, you can be sure and get your future dates in the grocery list. Click on the checkmark to generate the list. From here you can modify the list. You can change how much you need of something, delete an item or add an item. Use the very small icons to the right of the item to make edits. The pencil icon allows you to type and the trashcan allows you to delete items you do not need. When finished click SAVE grocery list and email it to yourself! Easy to view on mobile when grocery shopping. NOTE: The meal planner has been having some issues saving for some users. We are still working on finding the root cause of the issue so in the meantime we recommend selecting print plan and/or print recipes to either print them OR you can ‘cancel’ the print view and bookmark the page to find it later. We will announce when the problem has been solved.